If you feel tired or dizzy, or are prone to losing your balance, stay off the ladder. Do not use ladders in high winds or storms. Wear clean slip-resistant shoes. Shoes with leather soles are not appropriate for ladder use since they are not considered sufficiently slip resistant. Before using a ladder, inspect it to confirm it is in good working condition. Ladders with loose or missing parts must be rejected. Rickety ladders that sway or lean to the side must be rejected. The ladder you select must be the right size for the job. 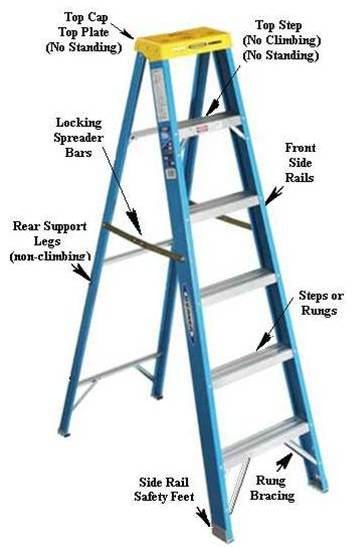 The Duty Rating of the ladder must be greater than the total weight of the climber, tools, supplies ,and other objects placed upon the ladder. The length of the ladder must be sufficient so that the climber does not have to stand on the top rung or step. When the ladder is set-up for use, it must be placed on firm level ground and without any type of slippery condition present at either the base or top support points. Only one person at a time is permitted on a ladder unless the ladder is specifically designed for more than one climber (such as a Trestle Ladder). Ladders must not be placed in front of closed doors that can open toward the ladder. The door must be blocked open, locked, or guarded. Read the safety information labels on the ladder. The on-product safety information is specific to the particular type of ladder on which it appears. The climber is not considered qualified or adequately trained to use the ladder until familiar with this information. Factors contributing to falls from ladders include haste, sudden movement, lack of attention, the condition of the ladder (worn or damaged), the user’s age or physical condition, or both, and the user’s footwear. keeping the center of your belt buckle (stomach) between the ladder side rails when climbing and while working. Do not overreach or lean while working so that you don’t fall off the ladder sideways or pull the ladder over sideways while standing on it. When climbing a ladder, it is safest to utilize Three Points-of-Contact because it minimizes the chances of slipping and falling from the ladder. At all times during ascent, descent, and working, the climber must face the ladder and have two hands and one foot, or two feet and one hand in contact with the ladder steps, rungs and/or side rails. In this way, the climber is not likely to become unstable in the event one limb slips during the climb. It is important to note that the climber must not carry any objects in either hand that can interfere with a firm grip on the ladder. Otherwise, Three Points-of-Contact with the ladder cannot be adequately maintained and the chance of falling is increased in the event a hand or foot slip occurs. I took the defensive driving class in Madison County the morning of December 18. I left from work at about 6pm the same day to head home in Ennis. As I was leaving Virginia City, the streets were wet , the temps were dropping, the wind was picking up, and it was dark (being the end of day, I was also a little tired). I was working my way uphill on a very curvy section of highway at a slower pace given the physical and mental conditions. A car was approaching me in the other lane, and in our combined headlights, I saw a deer step out in front of me. I had a decent amount of reaction time to turn on my hazard lights and begin slowing down even more (I briefly thought about flashing my brights but didn’t want to blind the driver). When it quickly became evident that the oncoming car was definitely going to hit the deer, I braked even more and began moving to the right shoulder of the road. While all of these responses seem common sense and very “of course that’s how I drive, I’m cautious”, your class made my responses much calmer and matter of fact, more “planned” as it were, than I think they would have been previously. So, thanks to you and your class, I was able to provide aid rather than be the one needing aid. 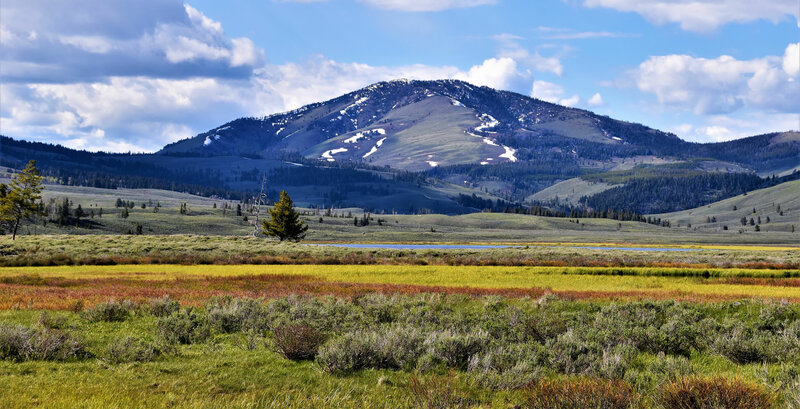 MACo enhances the public service mission of counties by promoting integrity and providing proactive leadership while acknowledging and respecting Montana’s diversity.